Butternut Squash Casserole: Fall for Flavor! My neighbor, Ellen Kinzer, is my idol. She is a wife and mother of 4 beautiful and successful grown daughters, she volunteers her time at church and in the community, she has spectacular flower and vegetable garden, and she is always cooking up something fabulous in the kitchen. The other day, she made Butternut Squash Casserole, first created by her eldest daughter, Erika. It looked and smelled so appetizing that I just had to give it a try. I added a little spice, some nuts, and some seeds and the result was a beautifully colorful and delicious tasting butternut squash casserole that is perfect for your next harvest gathering. Enjoy! 1. Cube butternut squash and place in roasting dish. Toss to coat with extra virgin olive oil, parsley, savory, sage, and pepper. Roast in 350 degree oven for about 1 hour. 2. Saute garlic, onion, celery, and carrots. 3. Cook quinoa in 2 cups vegetable broth per package instructions. Cook farro in water per package instructions and drain water after cooking. 4. 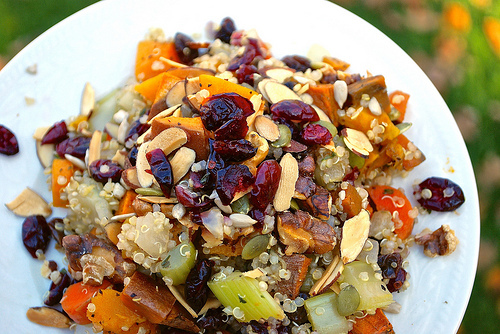 Gently fold cooked quinoa and farro along with pumpkin seeds, sunflower seeds, dried cranberries, and slivered almonds into roasting pan with roasted butternut squash. *Though farro is not gluten free, it is an ancient grain that is minimally processed and contains considerably less gluten than wheat. It is significantly high in protein and fiber. It can be tolerated by some gluten-sensitive and even celiac sufferers, but do test it with a very small amount and/or speak to your nutritionist. If there is any doubt, substitute brown, wild or even black rice. Just about anything will go great with butternut squash. 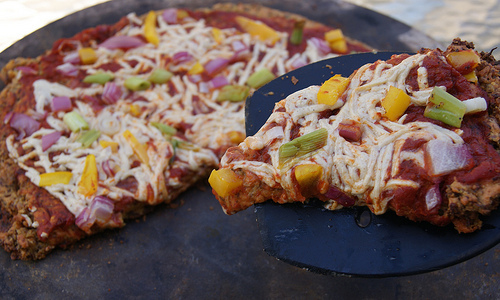 Cauliflower crust pizza sounds like a concept better left unexplored. I’ll admit it. But when a friend made it for our family, it had a flavor that was unexpectedly remarkable. Cauliflower crust stands alone before you even add the “pizza”. But it was messy; breaking apart into gooey delicious chunks. 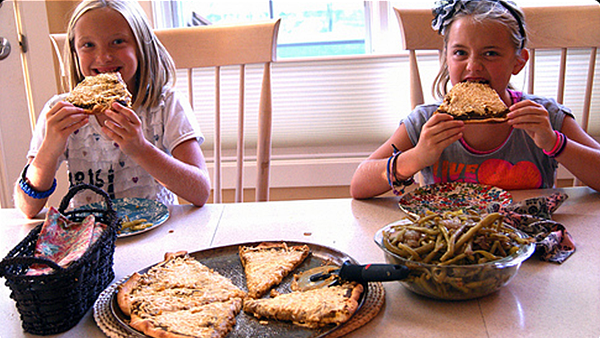 I researched tons of cauliflower crust pizza recipes, and they presented several challenges. They require egg and cheese. 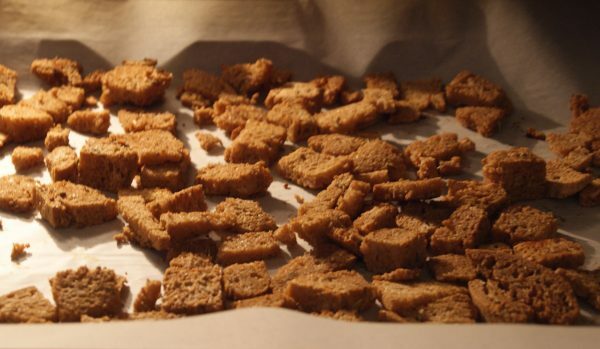 I tried substituting flax seed and vegan cheese; and was able to reproduce the flavor and texture. But the crust wasn’t something you could pick up with your hands. It was delicious and worth the effort, but I kept playing with it, eventually adding a gluten free baking mix. I’d like to say the 3rd time was the charm, but I stopped counting after ten. But what I can say is that the hard work payed off, and I’ve got two variations of OUTSTANDING cauliflower pizza crust. Bon Appetite! I cook everything to scale for an army, so feel free to cut this recipe in half. OR, freeze what you don’t use for easy access to future fast food. Delicious black rice lentil curry delivers a power pack of nutrition. Processed grains like white rice look and taste bland because they are…(unless they are dyed to attract the evolutionary instinct to eat a rainbow, or fried in saturated fat and salt) When there is no color, there is no nutritional value. The deep hues of black rice indicate a high level of designer antioxidants called anthocyanins, which have strong anti-inflammatory properties that work against diabetes, heart disease and alzheimers. And the flavor is a rich, nutty sweetness that needs no additional effort. 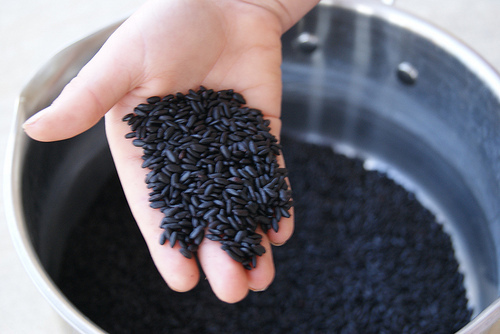 World supply levels for black rice are inconsistent. 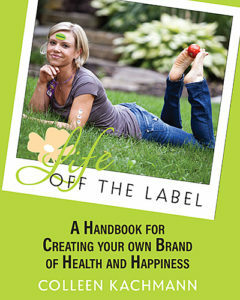 Demand is high because it is the latest superfood getting press. I found mine on Amazon through Lotus Foods. Directions: Add lentils, rice, water and bullion to a sauce pan. Bring to a boil, cover and reduce heat. Simmer for 30 minutes. Remove from heat. Chop garlic, peppers and onion and add to skillet. Whisk vinegar, Bragg’s and water together and pour over veggies. Saute for 10 minutes, or until desired texture is reached. Add chopped cilantro in the last minute and remove from heat. Whisk turmeric, curry and chili powder into coconut milk. Pour over lentil and rice mixture. Mix all ingredients into a serving dish. Garnish with sriracha chili paste. This healthy, hearty, and tasty dish took no time at all and was a family favorite. Just chop, bake, and serve… Now that is fast food the healthy way! Enjoy! Preheat oven to 350 degrees. Cut spaghetti squash in half, sprinkle with Italian Seasoning, garlic powder, and pepper and bake face down for about an hour until shell is soft. 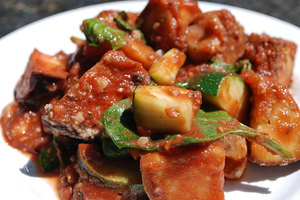 In a large bowl, add chopped eggplant, leeks, carrots, zucchini, pepper, tomatoes, beans, spices, seasonings, nutritional yeast flakes and mix well. Stir in spaghetti sauce and coat evenly. Spoon into baking dish(es). Bake for about an hour. Serve over spaghetti squash or mix spaghetti squash and ratatouille together, whichever you prefer. Serve warm. Enjoy! 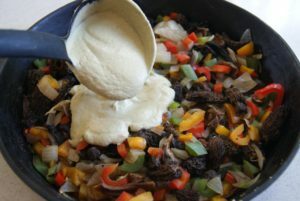 Here’s a gourmet mushrooms recipe creates a creamy, yet light sauté when added to fresh and seasonal veggies. 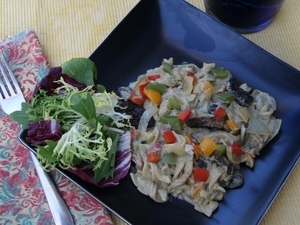 Exotic fungi are a delightful addition to any meal, but especially at the vegan table. The succulent texture, woody fragrance and savory character create a gourmet experience comparable (and compatible!) with the finest wines. And though freshly harvested gourmet mushrooms are appealing, restricting indulgence to a few illusive days in fall is not necessary.There are many delicious varieties cultivated in specialized growing environments; and when dried properly, seemingly simple flavors develop complicated depth. Ten pounds of fresh mushrooms are needed to produce one pound of dried. So while they seem expensive when compared to fresh, the value is ten fold. And as they last indefinitely, there is no risk in stocking the pantry. Mushrooms are a great addition to a plant-based diet. They generally are high in vitamin B and iron, as well as trace minerals, and contain stable antioxidants that aren’t destroyed in a short cooking process. If you rehydrate them in a sunny window, they actually MAKE vitamin D, much like our own skin. Nutrient levels and immune boosting-benefits are not affected by the drying process. Premium Mushroom Blend or bulk Dried Porcini Mushrooms are available through the Great American Spice Company, as well as most grocery stores. The blend is a bit pricey, but the eclectic selection can last a long time if you use them sparingly. Boil 5-6 cups plain water and pour over dried mushrooms in a mixing bowl. Add just enough to cover the mushrooms and discard the remainder. Let them soak (in a sunny window if possible) until they are tender. 20 minutes before serving time: Drain cashews and put them in a blender. Cover the nuts with about half of the broth produced by soaking mushrooms. Add yeast flakes, ground mustard and 1 tbsp each of seasonings. Puree until thoroughly blended. Taste it with your finger and fine tune as needed. I usually add a bit more salt. If it’s too thick, add a bit more broth. Cook pasta of choice according to package directions. I like Farfalle Pot Pie Bow Noodles (egg free) because it’s very light in texture and flavor. Add 1-2 tbsp salt to the boiling water, and the subtle flavor will pop. In a skillet, add the soaking mushrooms and remaining broth to desired veggies and garlic. Cook on medium heat until everything is tender, but brightly colored with a bit of crunch. Add seasonings just before removing from heat. Pour cashew sauce over sauté. Cook another 2-3 minutes. Stir frequently. Serve this gourmet mushrooms recipe over, or mix into, the pasta. Take compliments graciously. The end of summer has given birth to some gigantic zucchinis, which have sparked my creativity in the kitchen. I shredded the big-ole veggies in the food processor, used some in waffles, breads, muffins, and cakes and STILL had some left over. 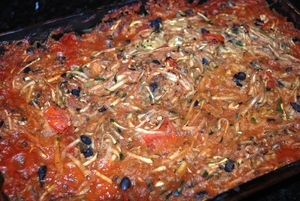 I decided to throw some shredded zucchini in a baking dish, add a jar of organic spaghetti sauce, some cooked black beans, carrots, tomatoes, Italian seasoning, garlic powder, pepper, nutritional yeast, and a little ground flax and bake the sucker for about an hour at 350 degrees. The result was amazing. The kids ate it like spaghetti and we all had seconds. Enjoy! Place ingredients in a oven-safe baking dish. Bake 350 for about an hour. Serve warm. Enjoy!